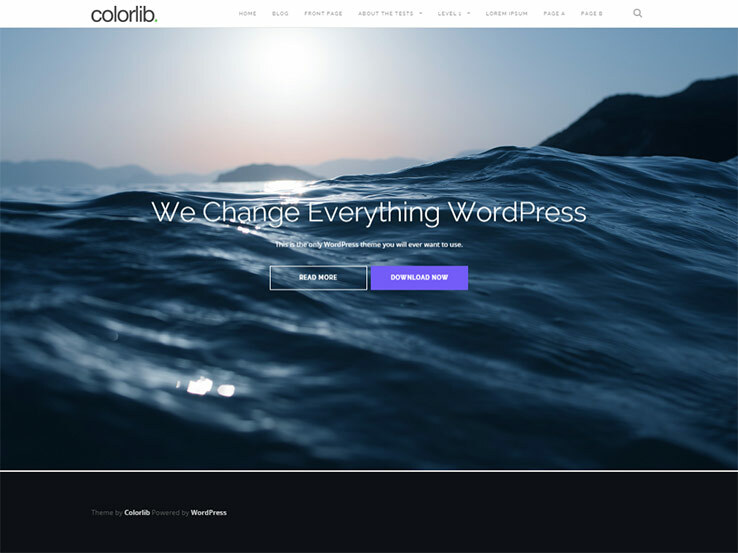 The one page WordPress theme is a beautiful invention, with the digital age in mind, where people don’t have to flip through pages like they would with an offline book or magazine. One page WordPress themes just make sense. They allow webmasters a chance to fit all of their content on the homepage, freeing up time they would generally spend organizing extra pages and navigational menus. Not to mention, all the focus is then placed on that individual page, leaving no question about where the users should go when landing on a website. Most of the one-page themes allow you to add additional pages, if you so desire. In fact, most of them include a blog section which takes visitors to a new page to read the post in its entirety. Some of them even allow for pages with more details about your individual projects. Yes, the one page WordPress theme is a wonderful choice, and a free one page WordPress theme is even better. As the one-page trend is quickly growing, hundreds of options are online for you to choose from. This makes it difficult for you to decipher between the good and the bad. Look for responsive design and different sections to highlight different parts of your website as well as custom calls to action to increase your conversion rate. 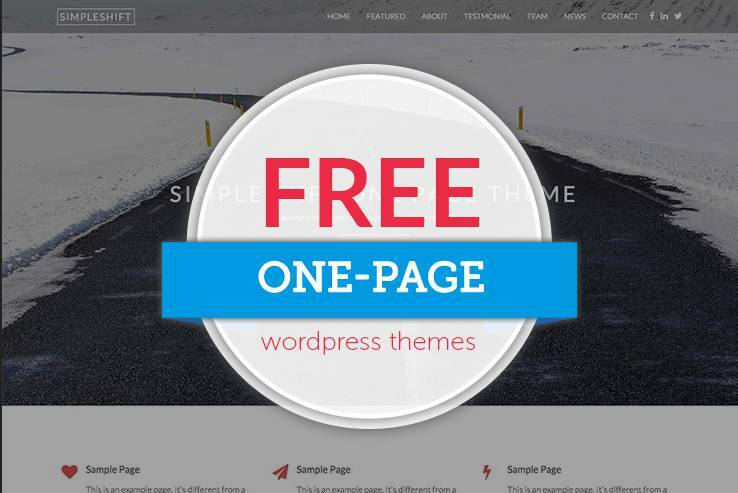 Luckily for you, we compiled the best free one page WordPress themes in a single article, leaving you with a sense that all of the themes on this list are well built. Now, all you have to do is find your favorite design. Good luck! Consider the Allegiant theme if you are more business oriented and want to present your services in style. This theme has all the tools you need to share information about your services as well as your portfolio and your employees. You can share your recent blog post or past projects in a beautiful slider at the top along with the core values of your business right below. You can also include a section with testimonials from past clients. A blog page is also included so you can attract potential clients and improve your search engine rankings. The theme allows you to easily change the colors and fonts and choose among several different page layouts. On top of that, you can use shortcodes to add buttons, columns, lists, and more. Along with responsive design, the Allegiant theme packs a surprising number of features for a free theme so give it a try today. The Venture One Page Lite theme is the closest thing you’ll get to a premium theme without having to pay any money at all. 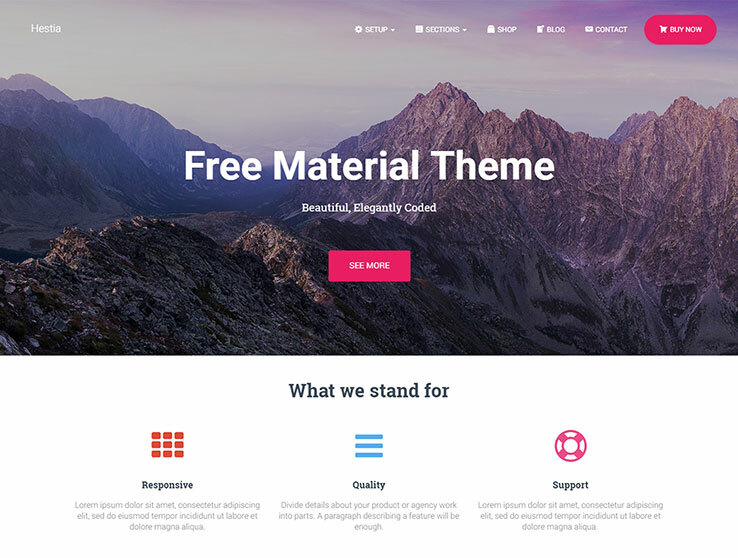 The theme includes plenty of features which makes it hard to believe this theme is free. If you’re running a business, it has options for testimonials, contact forms, and shortcodes to keep your development time to the minimum. If you’re a blogger, you receive a full blog, social media icons, and a full homepage section for showing off your related posts without any plugins. 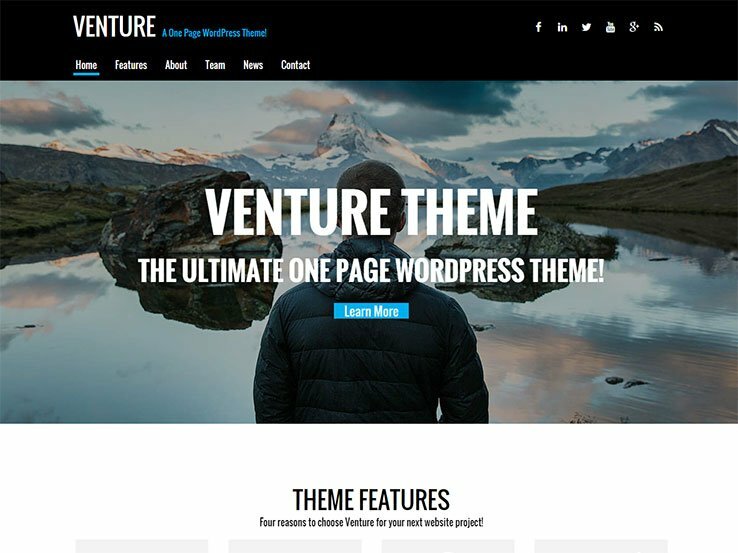 Overall, the Venture One Page Lite theme is a wonderful one-page option for keeping customers around and making your business look great in the eyes of search engines. This is a theme that comes with a premium version, so it’s worth noting that you can always upgrade to get more features if needed. With the free version, you don’t have the ability to use parallax images, a customizer or slideshows, but all of the content sections that sit on the homepage demo are included with the theme. The free version also includes quite a few wonderful call-to-action areas where you can change the text to send people to sales pages. The About Us section works for both bloggers and businesses, while the “Meet the Team” homepage section is best for those who are using this theme for their small business. Finally, the social media buttons, contact forms, and testimonials are all provided for your customization. 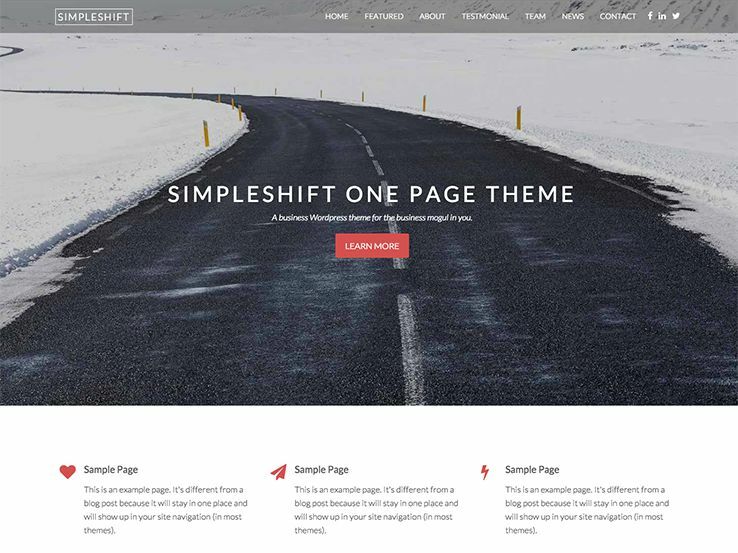 Simpleshift is the king of one-page WordPress themes. It’s stylish, sleek and clean and you don’t have to worry about configuring much of your content because most of the section are already preset for you. That’s not to say that you can’t make customizations, but the modules for displaying team members and testimonials are already set up in terms of design. The Simpleshift theme is completely responsive and it has a wonderful parallax background which is a great way to add visual appeal to your website and to boost conversions because it allows you to highlight a particular area on your website without slowing it down. Another great area of the Simpleshift theme is the contact form. This form looks sleek and it allows potential clients to easily get in touch with you. The Simpleshift theme is completely free, which is amazing considering you can include a module that presents your most recent posts in a professional grid-based format. The theme also includes several social media buttons and a testimonials section to feature testimonials from past clients. As you can see, many of the features that come with the Simpleshift WordPress theme would generally need third party plugins in order to work properly. However, all you have to do is download this theme and get started with the preset areas. The theme provides lots of value for free and it even has a huge header area with overlaying text and buttons, both of which factor in greatly when it comes to sending visitors to buy products or services. 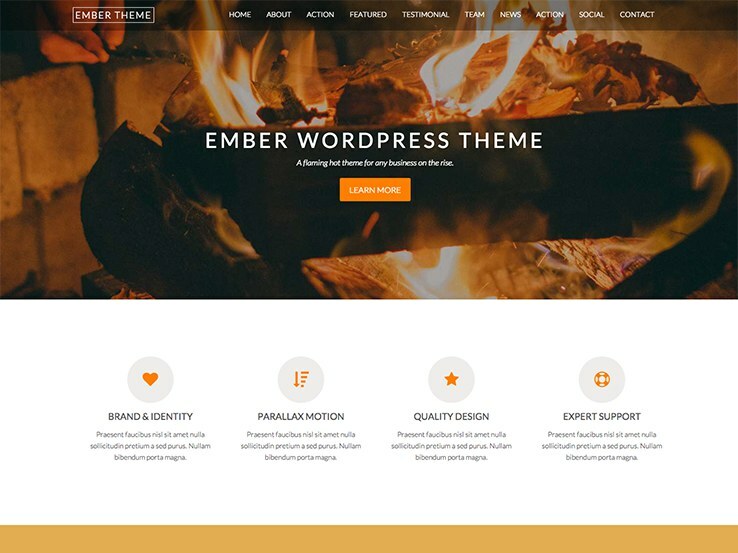 The Ember WordPress theme is one of those options that you can’t help but test out. It’s sleek, stylish, and filled with cool content modules to present all your business information. It’s a one-page WordPress theme with a responsive design which ensures your website will look great no matter which device your visitors are using. The header area has a few spots for implementing a brief description of your company and a call-to-action to send visitors to your sales pages. The parallax image in the header is one of the most important parts of the theme because it allows you to add a sleek scrolling effect without slowing down your website. A contact form resides on the bottom of the one-page layout, making it easy for potential clients to get in touch with you. The theme includes several predefined sections such as “Meet the Team” area, which is great for showing off the faces of your company. You can also include their social media buttons so visitors can connect with them on social media platforms of their choice. A testimonials row is helpful for building social proof and adding credibility to your company. Clients and customers are much more likely to send over some cash if they know that other people have had good results going with your business. Along with some sleek social media buttons, columns for featuring your services, and a wonderful design that grabs attention, the Ember theme is one of the best on the market. The Simple Business is a great choice for online businesses and bloggers that need a one-page layout but don’t necessarily have the budget for it. Premium upgrades are always available for additional features, but the Simple Business theme has most of the abilities you’d want out of a standard one-page theme. This theme looks great on mobile devices since many people are browsing while on smartphones and tablets nowadays. The multiple front page layouts are nice for structuring the way you want your content to look. However, the best part of this free theme is that it includes several content sections for talking about your business and sharing all the information necessary to give a quick overview of your services and products. The Simple Business theme provides an area to discuss your services, while right below that you can go into more detail with the About Us section. The “Meet the Team” module displays details about you and your team members and it allows you to share their brief bio and a profile photo. With most WordPress themes you need an extra plugin to display a recent article list but the Simple Business theme provides this functionality out of the box. Simple Lite may look like a basic one-page WordPress theme, but this one’s got plenty of settings and features to play around with. Simple Lite is completely free which is perfect for those who have a limited budget. The theme is easy to install and you can immediately get to customizing it. The theme has multiple banner and front page options to quickly show your customers what your company or blog is all about. Since all the information is included on one page, your visitors can immediately get all the information which makes it easy for them to browse the website. As with many one-page themes, the Simple Lite option is responsive. This means that the one-page layout looks amazing even on smaller devices. On top of that, the theme includes various customization settings such as shortcodes, scripts, and various other options. The entire navigation menu sits towards the top of the page and allows your visitors to easily get to the different sections on the homepage. Quite a few content sections are included with your download of the Simple Lite theme. You can feature an About Us or Connect with Us section in order to describe your company and send people to your top social platforms. A Meet the Team section allows you to feature your team members and display their social media profiles. Along with testimonials, recent article lists, and contact forms, the Simple Lite theme is one of the more useful free one-page themes on the market. 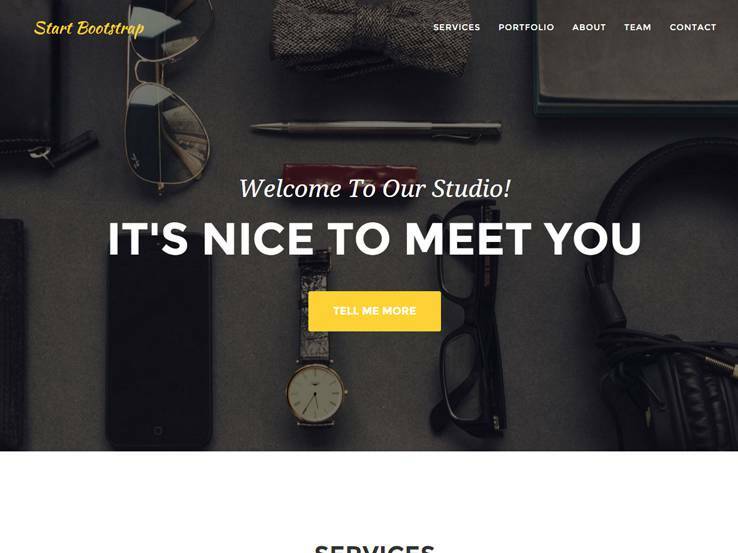 The Starter WordPress theme is one of the best free one-page themes on the market since it’s completely responsive and includes various tools, making it similar to any premium theme you could find. The modern design works great and looks great even on smaller devices such as phones and tablets. The one-page layout lets you show all your content on a single page, such as galleries, team members, testimonials, and services. The carousel slider works wonders for sharing promotions and images, while the parallax background is a great way to capture the attention of your visitors. A standout feature with the Starter theme is the portfolio gallery, giving you a beautiful way to show off your past work to potential employers. On top of that, the theme includes a full-featured blog with a clean layout so you can easily share valuable tips with your audience and boost your SEO rankings. Hestia falls in line with the growing trend of one page websites that are popping up everywhere. Plus, it is built using material design for added visual appeal and a unique design element not seen everywhere. Placing all of the focus on your site’s homepage by implementing a smooth parallax scroll effect, Hestia allows for custom backgrounds that support images, video, and even sliders. 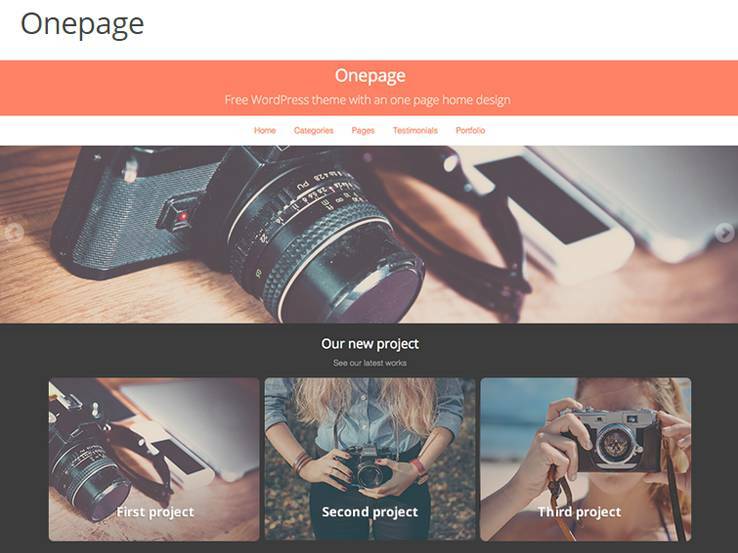 Plus, for those who wish to add separate pages for things like a blog or an online shop, this free one page theme lets you create a mega menu that organizes your entire site for your readers. With Hestia you have full control over every section you build using the SiteOrigin Page Builder plugin. Change colors, fonts, sections, logos, and more using the Live Theme Customizer. 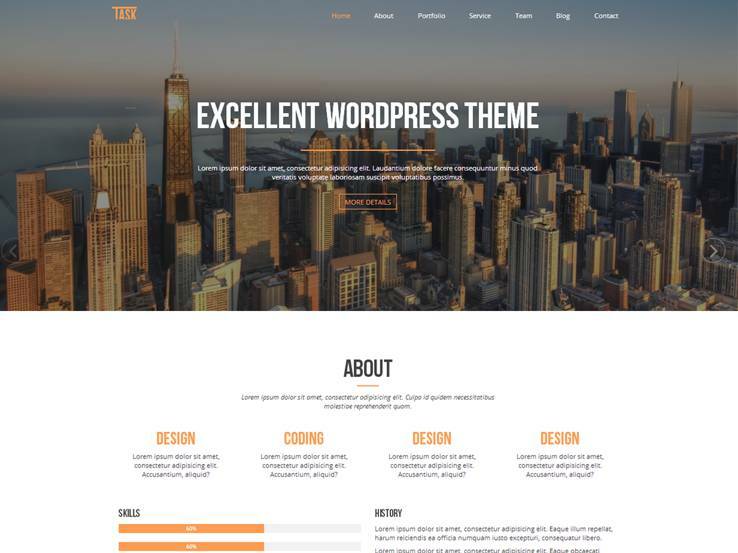 Plus, this theme comes compatible with 100+ other free WordPress plugins for adding extra functionality to your website as needed. One Engine is a strong front-runner featuring a clean interface and multipurpose elements to make the design process easier for both beginners and advanced users alike. The header area takes up most of the screen and it offers a slider with stunning animations to grab the attention of your visitors. The rest of the homepage is filled with premade modules to include information about past clients, services, about information, team members, portfolios, blogs, and more. A contact area is also included so your visitors can keep in touch with you. Several animations are incorporated into this free theme and social media integration allows you to easily grow your social media following. You can even incorporate a beautiful pricing table for selling software or services, along with a stunning portfolio with clickable links and image thumbnails. Consider the Shapely WordPress theme if you’re looking for a feature-rich one-page theme with limitless customization options and a sleek layout that’s great for business websites and landing pages. The frontpage is well-organized with a beautiful fullscreen hero image at the top and sections to feature your portfolio, testimonials, client logos, services, and other information relevant to your business. We like that the hero image includes overlaying text, which you can use to welcome visitors and introduce your website, as well as call-to-action buttons to lead people to the important sections of your website. The theme’s homepage is build using widgets, which provide somewhat a drag-and-drop interface and does not require coding knowledge. Besides, the back-end provides customization tools to match the theme with your brand and there’s also a blog to share knowledge and generate more traffic to your website. The Agency theme is a one-page theme for agencies or marketing companies with a strong portfolio to assist companies to showcase their past work. The fully responsive theme has smooth page scrolling and you can also feature your company services with beautiful FontAwesome icons and overlaying text. The portfolio is setup in a grid format and it provides pop out areas for easier viewing. The team member section is a standout feature since it looks similar to something you might find in a premium theme. This module offers circular team member photos, along with social media buttons. Agency also offers a contact form with built-in validation, along with a beautiful footer with social media links, copyright information, and other details. 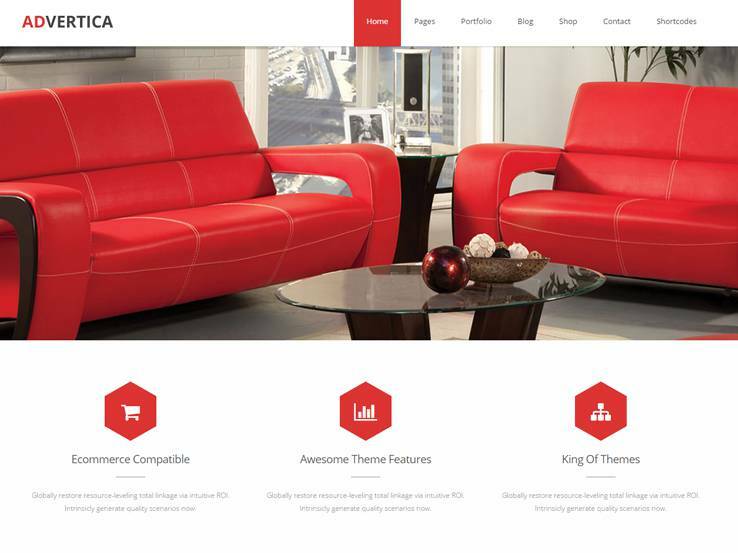 The Moesia theme is one of our favorite free one-page themes since it can generally be used for just about any type of business. The entire homepage is built by using eleven pre-designed blocks. Each of these blocks can be placed throughout your homepage to showcase anything from team members to services. Every single one of these blocks has the option for parallax backgrounds and custom colors which allows you to effortlessly incorporate your brand and grab the attention of your visitors. Several Google Fonts are included with your purchase and two blog page layouts are included for a little variety in your design. 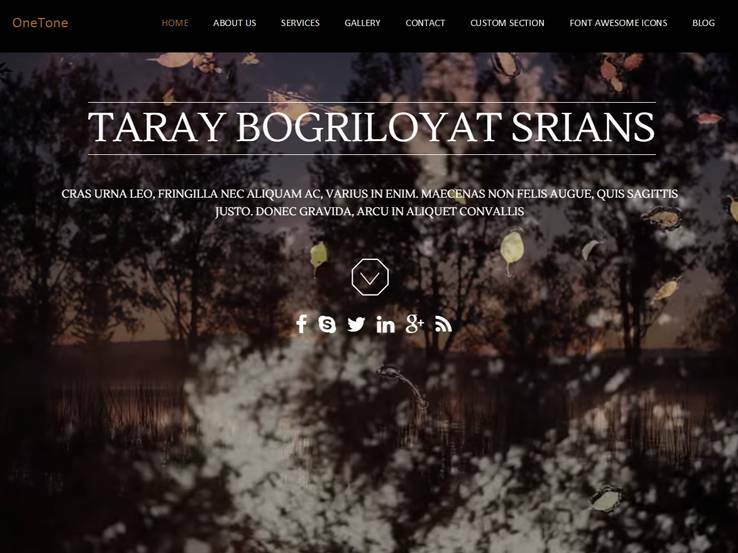 Several cool animations and effects are available and the parallax effects extend into the header for your entire website. 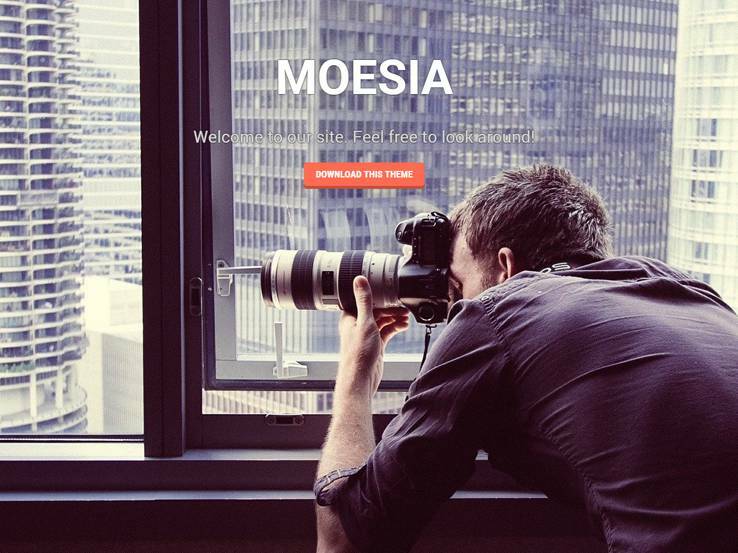 Along with threaded comments, translation-ready features, sticky posts, a responsive layout and featured images, you can’t go wrong with the Moesia one page WordPress theme. Consider the One Page theme if you’re interested in a one-page theme that can also convert into a multi-page website. 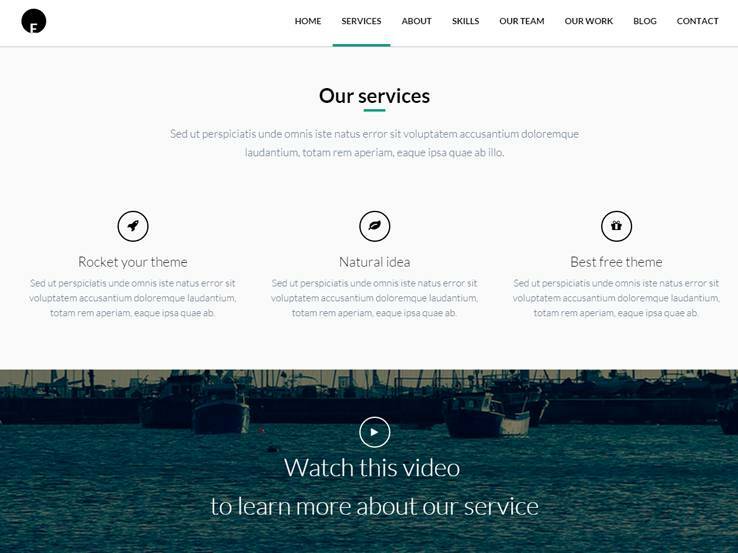 This responsive theme provides a quick switch so that you can convert back to a multi-page theme if you don’t feel like the one-page layout works well for your company. Show off your latest works with ease, and customize a slider to display your latest projects in style with high-resolution photos. Customer testimonials are highlighted in one of the homepage modules and clean and flat design keeps the One Page theme lightweight. A standout feature is the WooCommerce integration which means you can add an online store to your website in a matter of minutes. The theme is also translation-ready so you can easily translate your website and reach a wider audience. The Fullscreen Lite theme is an elegant and clean one-page theme, which can also be used as a simple landing page. Although you can upgrade to the premium version for this theme, it’s not a bad idea to test out the free theme since it has quality features which rival many premium themes. The responsive theme has a full-width slider, which allows you to easily showcase your promotions, events, or latest articles. Multiple layout options are included with your download, and the portfolio looks wonderful, even when comparing them to some premium themes on the market. The modular homepage is a nice touch, and the shortcodes ensure you don’t have to get your hands dirty with messy source code. Along with threaded comments, a fluid layout, and translation ready tools, the Fullscreen Lite theme isn’t a bad choice for creatives on a budget. 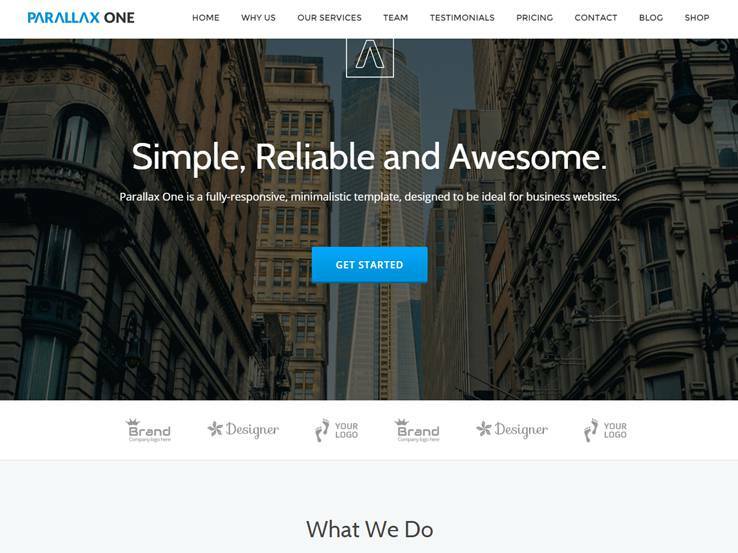 The OneTone theme has a stunning header area which is sure to capture the attention of anyone who lands on your website. This one-page business theme works well for just about any company and it lets you add all the necessary information into a single homepage area. As with many of these one-page layouts, the theme includes a few modules to feature on the homepage, including areas for clients, team members, services, galleries, about information, and more. You can also use the admin area to add more sections in a few clicks. Feel free to change the background to meet the branding of your company and consider using the parallax background to add smooth transition effects without slowing down your website. The theme provides a video background option which is a great way to stand out from the competition. OneTone has Font Awesome icons, a responsive layout, and areas to modify CSS and HTML, which is handy for more experienced developers. Finally, OneTone offers areas to upload your logo and favicon with a click of a button. The Advertica Lite theme packs a solid punch with its bright colors and bold text, making it a great one-page theme for many types of businesses. The responsive and multipurpose WordPress theme has a strong portfolio which is ideal for both individuals and agencies looking to attract more clients. Although you can consider upgrading to the premium version, Advertica Lite provides a few solid features such as a parallax section for bringing attention to important parts of your website. An impressive landing page is also included which pairs well with a one-page website since you can send people directly from one simple page to another. Showcase your products and services without any distractions and modify colors, menus, and sidebars. Threaded comments increase the interaction on your website, while the translation-ready nature of the Advertica Lite theme means it’s easy to use the theme with any language. 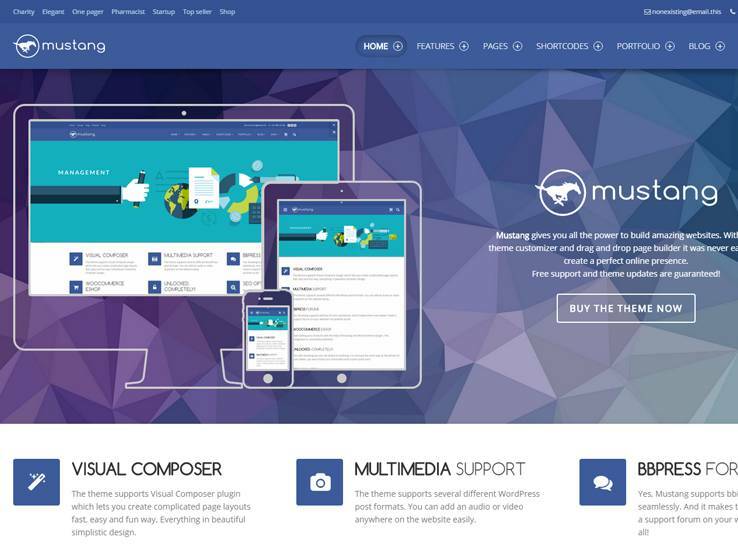 The Mustang Lite theme has a rather professional look to it so it works best for companies which need a clean and professional online presence. That said, it features a responsive layout that looks great even on mobile devices. Every section of the one-page theme is completely customizable, with options for custom colors and background images which are a nice starting point to incorporate your own brand. The theme is translation-ready so you can reach a wider audience and the basic blog design puts all of the focus on your content and eliminates all the distractions. A paid version of the Mustang Lite theme is available, but we recommend trying out the lite version beforehand. That way you may realize that all the features you need are in the free option. The header area has various colors to choose from and it takes up most of the screen area for sharing an important message for your first-time visitors. It even has room for images, overlaying text, and buttons. 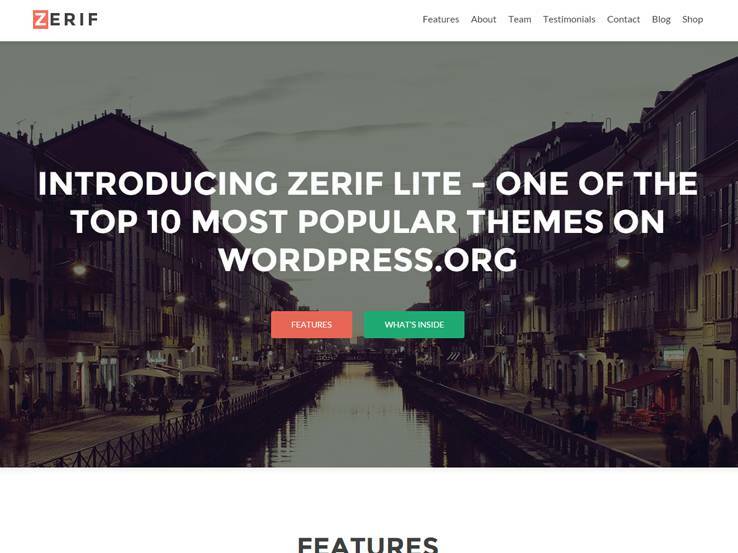 The Zerif Lite theme is one of the most popular free options on the market and it provides a stunning one-page layout for creatives and business professionals alike. Use the header area to show off your high-resolution photos and incorporate overlaying text and buttons to send people to your products or service area. Parallax support is included with Zerif Lite, making it easy to add visual appeal to your website. The responsive theme is WooCommerce compatible in case you plan on selling items and making money through your site. The threaded comments encourage the conversation to keep people engaged with your site and the language support provides one of the easiest ways to translate your content for other people to read. 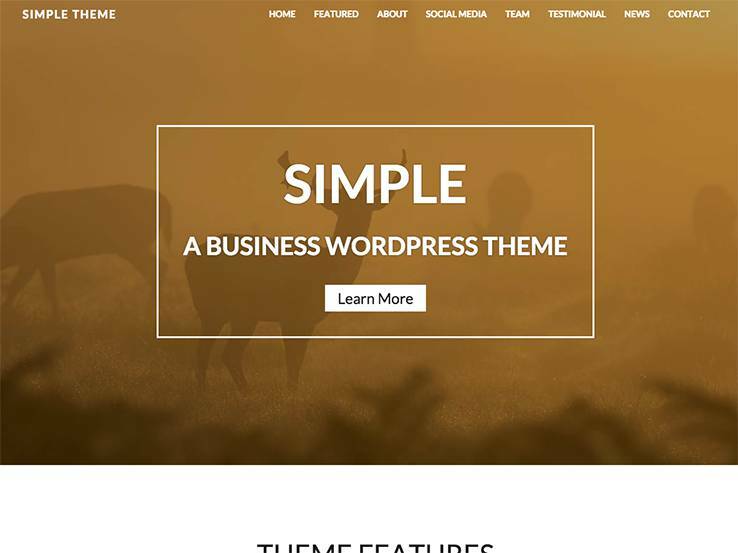 The Business One theme is a fairly popular choice and it’s a great choice for corporate and business blogs that want a one-page theme. The theme is completely responsive and includes customization options such as the ability to upload your own custom background. You can also customize the colors and the header to incorporate your own style and make your website match your brand. Use up to three columns and translate your website into any language thanks to the translation features. The sidebars allow you to easily implement various content blocks from social sharing to recent post listings. 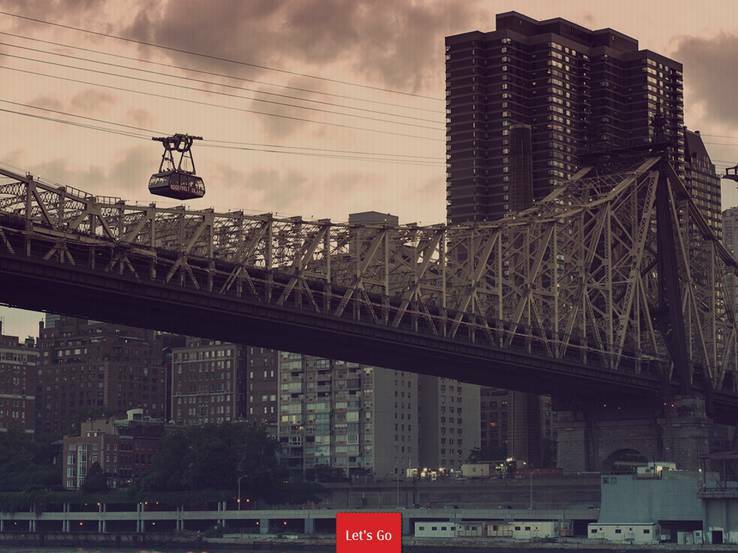 This is a full-width template with featured images which allow you to easily attract the attention of your readers. A full-featured blog also comes with the Business One theme, which is wonderful for sharing valuable content with your audience and boosting your search engine rankings. The top header area of the theme has overlaying text and buttons which serve as a wonderful call to action. 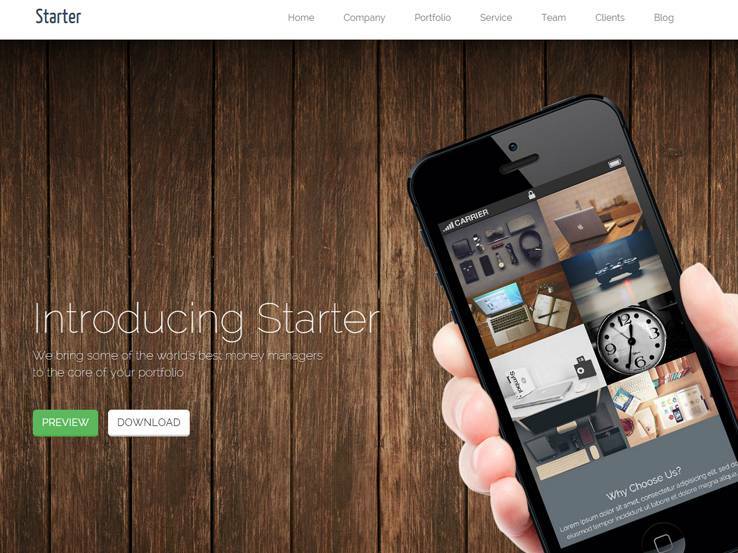 Overall, it’s a great theme for those companies that want a professional and an affordable theme. 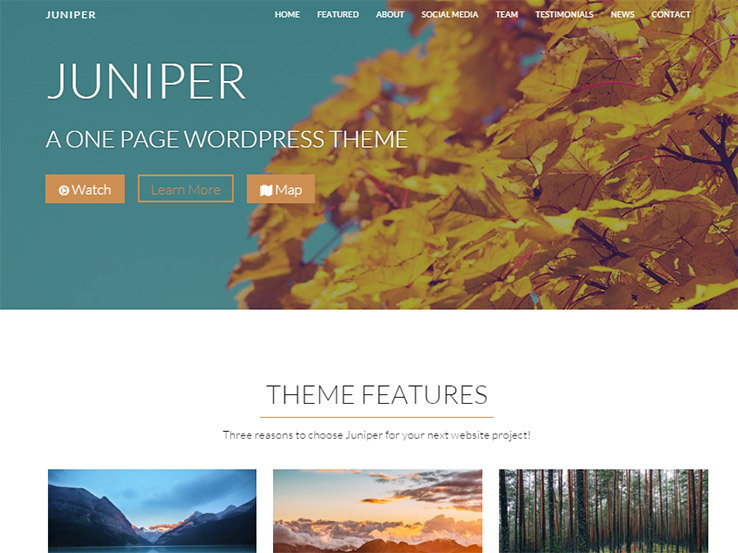 From Themeshift comes Juniper, a responsive and professionally designed one-page WordPress theme suitable for businesses. It includes all the sections needed to present the important aspects of your business in a single page that’s easily accessible to your users. There’re sections to highlight your services, about info, testimonials, and more. The “team” section is particularly impressive as it showcases your team members information complete with their avatars and social icons pointing to their other online profiles. The parallax sections will make your website memorable and are perfect for displaying your call-to-action buttons. Besides, there’re social media icons so people can easily follow and share your content on different platforms and a contact form at the bottom for people to easily get in touch with you. Parallax One is a clean, creative and fast-loading one-page theme from the folks at Themeisle. 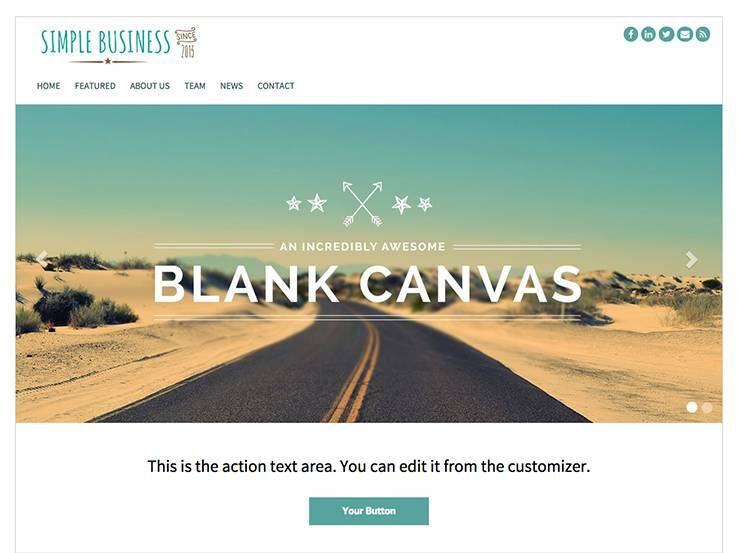 Perfect for businesses, the template brings a wide range of creative features such as parallax sections that work great with call to actions, Google map integration to show your exact location, and custom content blocks to present things like your team members, products or services, about info and testimonials. The Parallax One theme can be easily translated into different languages and unlimited color options allow you to build your brand. Additionally, there’s an eCommerce module if you’d like to add an online shop to your site and a user-friendly theme options panel to easily control your website’s settings. 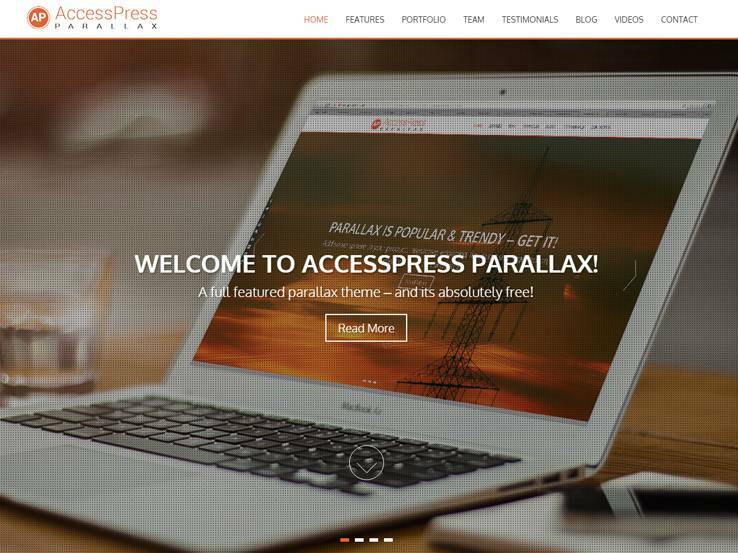 The AccessPress Parallax theme has an excellent parallax design and is packed with plenty of wonderful features you’d only expect in premium WordPress themes. The theme is great for business websites as it includes sections for team members, testimonials, services and portfolio. Besides, there’s a contact form at the bottom for people to easily get in touch and an eCommerce module that allows you to sell your products online within minutes. This template is fully responsive to cater for users on the go and you can easily translate it into different languages. Along with Google map support, social media integration, and sliders with overlaying text and call-to-action buttons, the AccessPress Parallax theme packs a powerful punch for a free template. 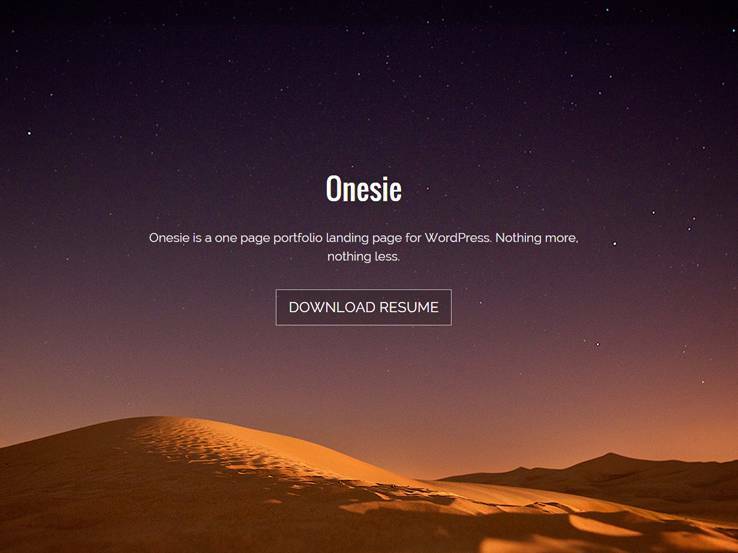 The Onesie WordPress theme is an excellent option for presenting your portfolio in a simple and stylish way. It has an elegant responsive design that works perfectly on mobile devices and you can easily customize it to match your style. The header area includes welcome text and a call-to-action button to lead people to your important sections. Furthermore, there’s a portfolio section to present your past works, an about us section, and a spot at the bottom to display your contact information. You can create an unlimited number of galleries to showcase your photos and there’re custom widget areas where you can add things like subscription forms, text blocks, and images. In terms of customization, you can easily upload your own logo and change backgrounds, headers, menus, fonts and more to match your brand. Also, the Onesie theme updates automatically to the newest version with one click, which is essential in keeping your site secure and high-performing. Thanks for sharing your feedback! We really appreciate it.